Anchorage, Alaska - Another new website documenting the corruption of Alaska senator Ted Stevens was unveiled Tuesday. Ted Stevens is under multiple criminal investigations for corruption and bribery. The Alaska Democratic Party today unveiled www.RetireTed.com, a new web site about the record of U.S. Sen. Ted Stevens, R-Alaska. The site reveals some of the many ways Senator Stevens, who is under federal investigation for corruption, has misused his public office. "Power corrupts and Ted's actions have become a national scandal," said Alaska Democratic Party Chair Patti Higgins. 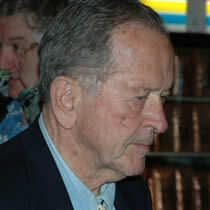 "Ted Stevens has been exposed. The FBI and IRS have raided his home. He is under a big cloud of suspicion. How can he possibly be effective in that atmosphere? "The worse of it is, the legitimacy of Alaska's needs may be disbelieved in Washington because our chief spokesperson has lost credibility and trust. It's time to retire Ted," Higgins said. "Alaskans need an ethically attuned Senator who can inspire the trust of colleagues and constituents." Sen. Stevens is under investigation for allegedly steering federal contracts to VECO, a company at the heart of Alaska's Republican corruption scandal. The FBI is investigating whether Ted had a role in arranging VECO's big government contract with the National Science Foundation.